I really need to check reviews before getting games. I got Nikopol: Secrets of the Immortals because it’s based on a great French comic by Enki Bilal. Turns out it’s a 2-D adventure game along the lines of Myst, the cream of 1993. Static backgrounds; you don’t even see your character walking around. There’s no manual with the Steam edition, so there’s no clue how to interact with the world; from a glance at a walkthrough, the puzzles are arcane and arbitrary. And the other problem with buying Steam games comes up: you can’t even give them away. Then I got the indie games pack that was on sale. 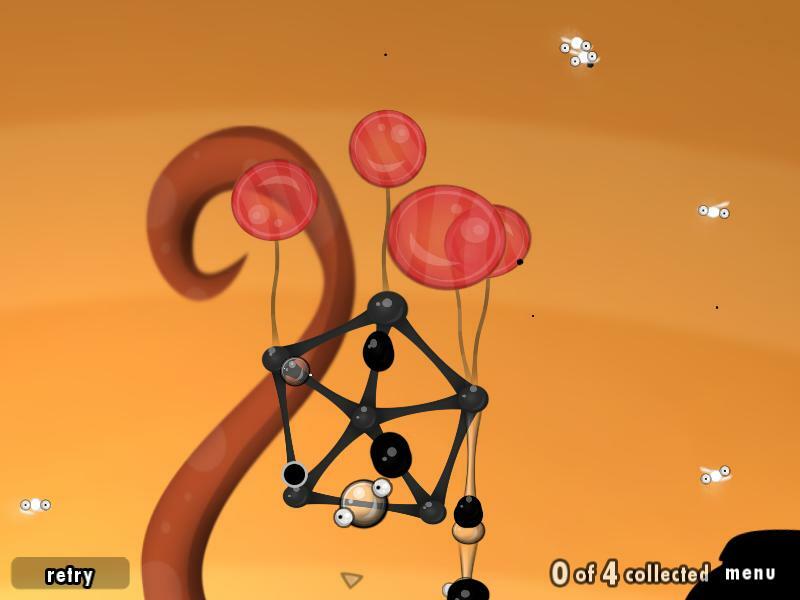 Best of the lot: World of Goo, a light and clever game where you build structures using little goo balls. There are many types of goo with slightly different properties– the red balls in the picture are balloons, for instance. Making a goo structure float. Then there’s The Path, which I was curious about. Pretty graphics; strange emo atmosphere. It’s nice to see something produced that’s this personal and offbeat; on the other hand I don’t find it that compelling. Everyday Shooter: not every day, thanks. An overgrown flash game, basically. Braid: probably great for people who grew up playing Mario. I didn’t, so I found it just annoying. Blueberry Garden: another damn platformer. Total: out $36, for one good game that I could have gotten by itself for $20 (but probably wouldn’t at that price).